Umpires for the 2016 World Baseball Classic Qualifier (Australia Stage) convened in Sydney, AUS and officiated the first round of qualifying games for the upcoming 2017 WBC, featuring teams from Australia, New Zealand, Philippines, and South Africa. Six games were scheduled from February 11 through February 14 (Feb 10-13 ET). Travis Eggert (USA; Pacific Coast League [PCL]). Brett Robson (AUS; Australian Baseball League [ABL]). 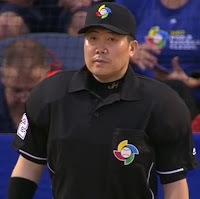 *Takanori Yamamoto also officiated the 2014 MLB Japan All-Star Series. WBC Qualifier 2 will take place March 17-20 at Estadio B-Air, Mexicali, Mexico.